31+ braiding hair secrets - that just might change your life. Braiding Hair: I don’t know about you, but I’ve got girls constantly asking me to do cute braids on their hair! It’s time to consult the web and get myself some fresh ideas and tutorials. Thought I’d share my latest finds of ways of braiding hair. 1. The “Frozen” braids are going to be a must at our house this Halloween. Here. 2 -10. Maybe a different princess will be at your house this Halloween? If so, be sure to checkout this website for tons of hair ideas! 11. This Puffy Headband braid is so adorable! See it here. 12-23. How to rock french braids. 12 ways. Check it out here. 24. More great Frozen tutorials. Here. 25. Have long hair at your house? This website has fun tips for those long tresses! 26. Short-haired girls can have fun too! Here. 27. Gorgeous mermaid half braid here. It’s amazing! 28. Twist a unique spin on your next ponytail. Here. 29. 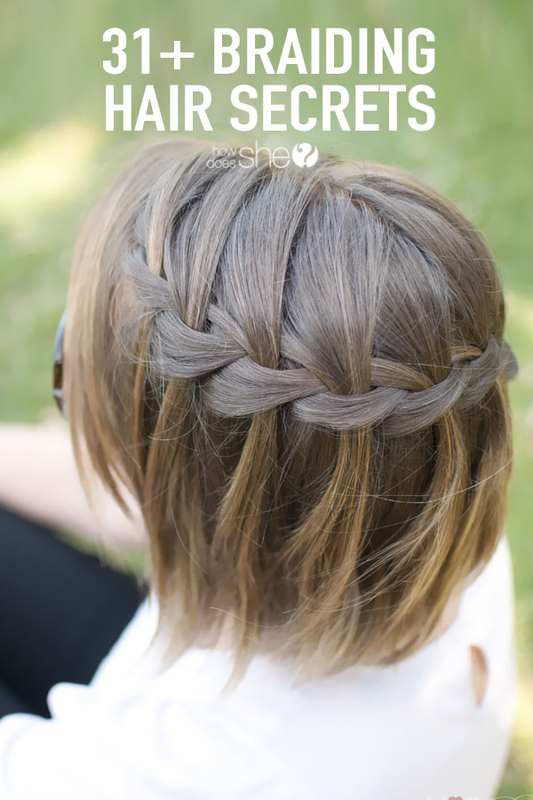 Crown of braids for Little Girls (and big girls, my 12 year just said she wants this braid!). Here. 30. Triple Braid side to pony. Looks like one even I could do! Here. 31. This is a fun one! This website showcases the ABCs with their hair. This is the letter X. Here. 32-42. More hairstyles and even some video tips! Here. It’s time to get your braid on with these Braiding Hair ideas! Want more hacks and secrets? Thanks so much for sharing one of our hairstyles in your post! The ABCs were so much fun to do with my (at the time) pre-schooler! They are super creative! We loved them! Looking at some ideas to braid my girls hair, so that way it looks more presentable so when they go out to out of school functions. I do a lot of weddings and love working with braids. I have been trying to learn to french braid. I am all thumbs but I am getting better. I love being able to to get her hair off her face! This was really helpful for us novices. I’m so excited to try some of these. The good old ponytail was getting a little tiresome. 12-23. How to rock a french braid. 12 ways. I was looking for information on the bottom right hand picture #12 but couldn’t find it, Can you help me? would love to learn how to French braid and do different creations to my granddaughters hair. Love these. Cant wait to try them out on my daughter. Most of the styles wont turn out because i am a beginner and she has long, thin hair. Any tips for braiding curly frizzy hair on a very active 3 year old? Thanks! I’d love to learn more, my kids would love it too! These are great! I’ll have to show them to my daughter and get practising! great hairstyles thank you Katie for sharing it.